Finally, I am with this super soft perfect, freshly baked Home Made Pull Apart Bread. 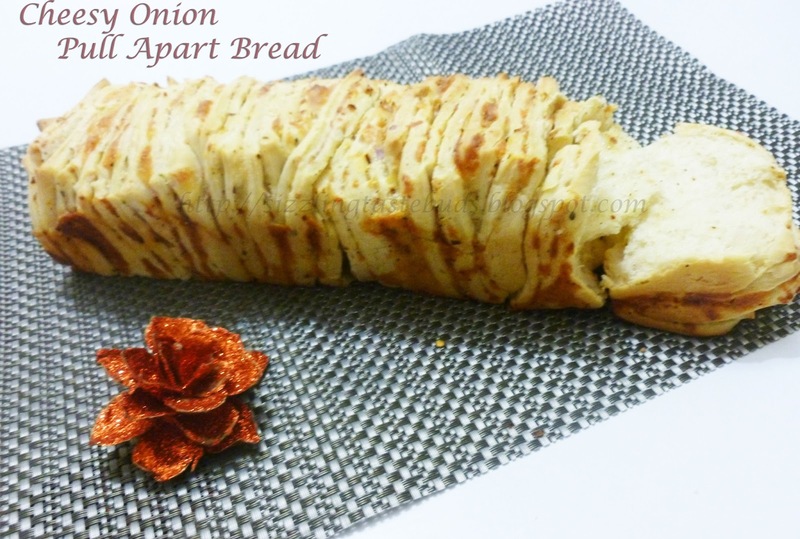 This is my very first attempt in baking a BREAD. Have been planning to prepare this for so long. Baked it yesterday and I am happy with the result. 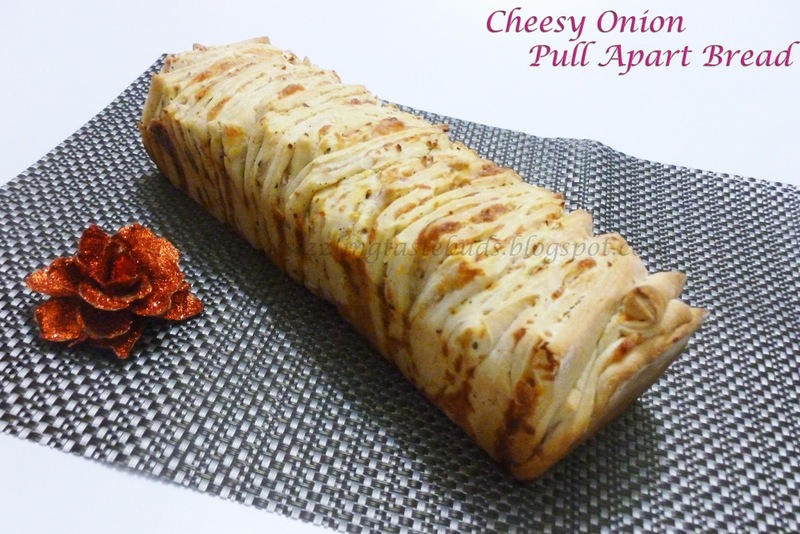 Prepared a filling of cheese, onions, Italian Mixed herbs and Chilli flakes. 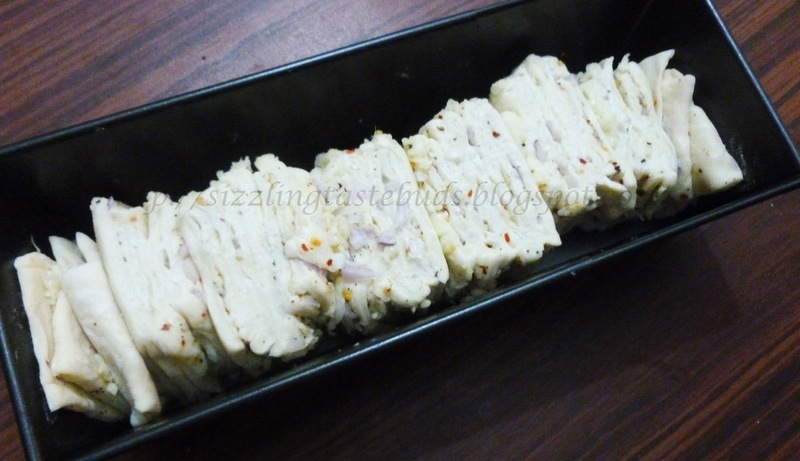 I am surely gonna try this out again with some sweet fillings. Milk - 1/2 cup + 2 tbsp to brush over the bread. 1. Dissolve Sugar and Dry Active yeast in a small bowl with some warm milk. Rest it for 5 mins till yeast bubbles up. 2. Mix Maida, salt and soft butter with 1/2 cup of milk and this prepared yeast mixture. Knead all together to get a soft, elastic, non-sticky dough. Add little extra flour if the dough is sticky. 3. Coat this dough with oil and place it on a lightly greased bowl. Cover it with a towel and leave it untouched for about 1 and 1/2 hours to rise to almost double in volume. 4. Dust your work surface lightly with the flour. Shape the dough into a square and roll it to make a larger square that is about 12' by 12' size. 5. Brush the surface of the rolled dough with melted butter. Evenly sprinkle herbs, chilli flakes, finley chopped Onions and Grated cheese. 6.Use a rolling pin to slightly press the toppings to the dough. 7. Slice the dough with a pizza cutter from top to bottom into 6 long and even strips. Gently lay each strip on top of another. 8. Cut it with a knife into 6 equal divisions. 9. 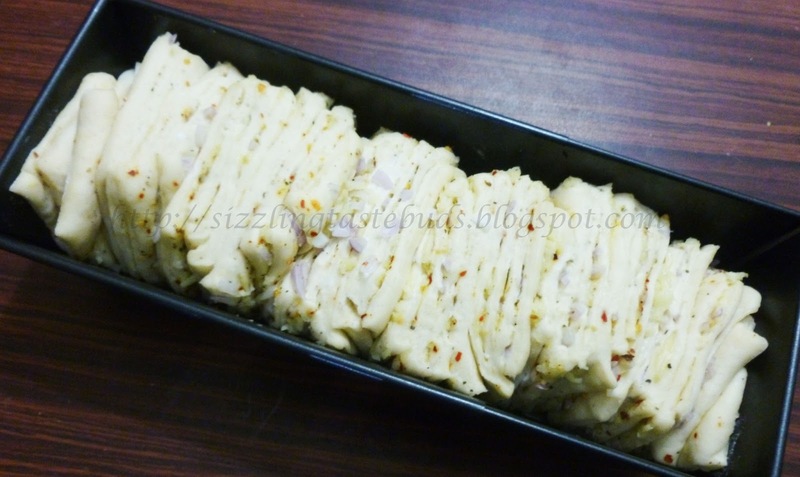 Place this in a greased loaf pan as shown in the pic below. 10. Cover the loaf tin again with a towel and allow it to rest for another 1 hour to rise in volume again. Lightly brush the top with some milk. 11. Bake at 180C for about 45 mins until its done and the top turns slightly golden brown in color. 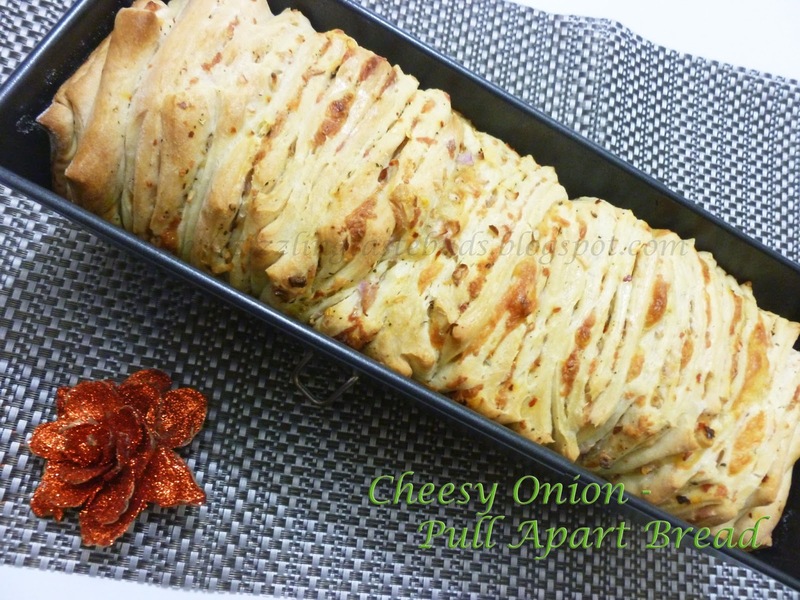 Freshly Home Made Cheesy Onion- Pull Apart Bread is ready to be served. Thats looks awesome! Great work dear!